As I didn't have Oreo, I just frost it with whatever ingredients I have. They are: Freshly Grated Coconuts, Pandan Kaya, Chocolate Rice, Rainbow Rice, Chocolate & Walnuts and Chocolate & Strawberry Jams. 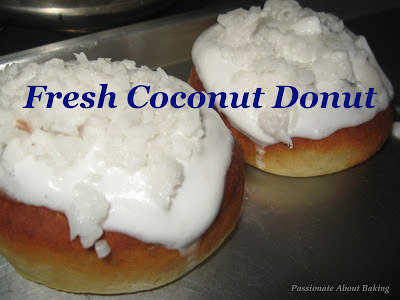 I like the fresh coconut dounuts. It's very rich & nice! I'll share the recipe with you. Extracted from Chocolate Galore by Caroline Barty, (modified by me). 1. Mix the flour with the yeast and salt. Add the caster sugar, then rub in the butter until the mixture resembles fine breadcrumbs. 2. Heat the milk until it is warm. Whisk in the egg yolks, then add the liquid to the flour. Mix to form a soft dough. Cover the bowl with cling wrap and leave in a warm place for about an hour or until the dough has doubled in size. 3. Knock back the dough on a well-floured surface for 5-10mins. Roll out the dough to 1cm thick and stampout rounds with a plain pastry cutter. Make a hole in the middle of each round with your finger. Place the doughnuts in a greased tray and leave to double in size. 4b. Bake it in the oven at 200C for about 8-10mins, or until they turned brown. Remove from the tray immediately. 5. When cooled, frost it anyway you like. Also sharing my Friday's bake: Checkered Cake. Saturday's instant fun: Popcorns with salted buttery sauce! 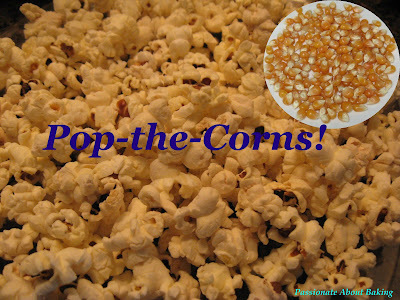 Popcorns are very easy to make. Just buy the corn seeds from supermarket, pop them into the microwave and see them pop! Then melt salted butter in the microwave and pour it over the popcorns! They give...simple pleasures! Cheap & good & satisfying! Who says popcorns are for movie-goers only? Those donuts look sooo good! 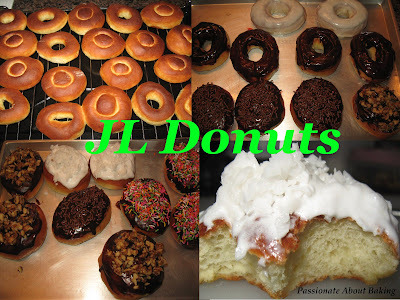 I'm not a fan of donuts but i have to say of all the donuts i've tried, J.Co definitely comes up tops. 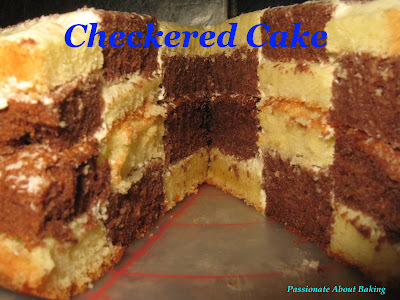 The checkered cake looks perfect- it doesn't look like it's doable in a home kitchen at all! Whoa! And you say it's really simple? It sounds like it would take ages to make! Do you freeze the cake first to make it easier to cut or is the cake really firm and compact?